When should police pull the trigger and when should they back off? That's the crux of the training officers receive in a simulation room of the San Francisco Police Academy. 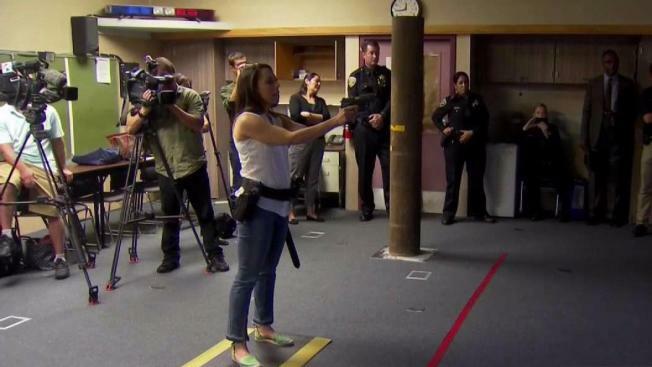 On Monday, members of the media were invited by SFPD to participate in the annual drill in hopes of countering the coverage police usually get when it comes to using force. The simulation room features a screen and computer projector loaded with many scenarios. Training used to be shoot or don't shoot, but now SFPD wants to project the message now is going well beyond just two choices. Officers are trained to hide behind cover, create distance between themselves and a suspect, and rather than bark command they are trained to listen and response when they can with less-than-lethal force. In addition, officers are trained with a baton, pepper spray and lastly a firearm. Missing are the Tasers police have been trying to get for years. SFPD Commander Peter Walsh said some of the push back is the belief Tasers will allow officers to forget their de-escalation tactics.